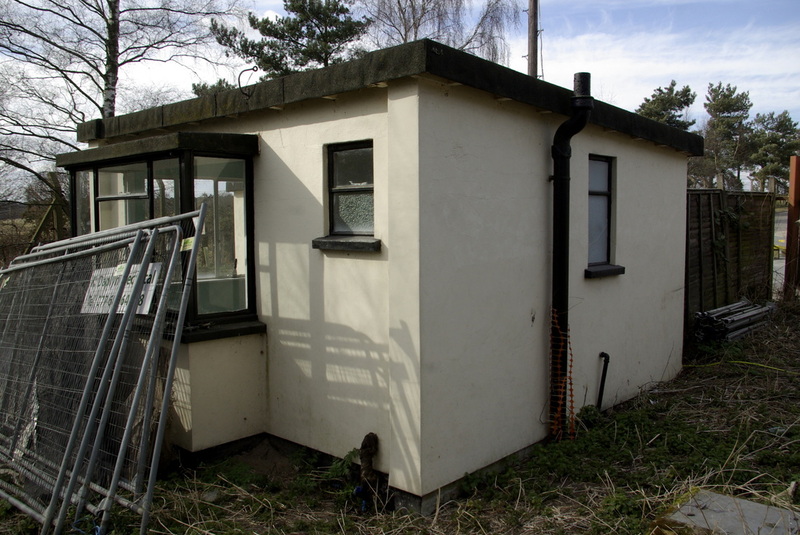 RAF Barnham NSS was heavily secured and at the time was probably one of the most secure locations in the UK. The security element was the responsibility of the RAF Police (RAFP). 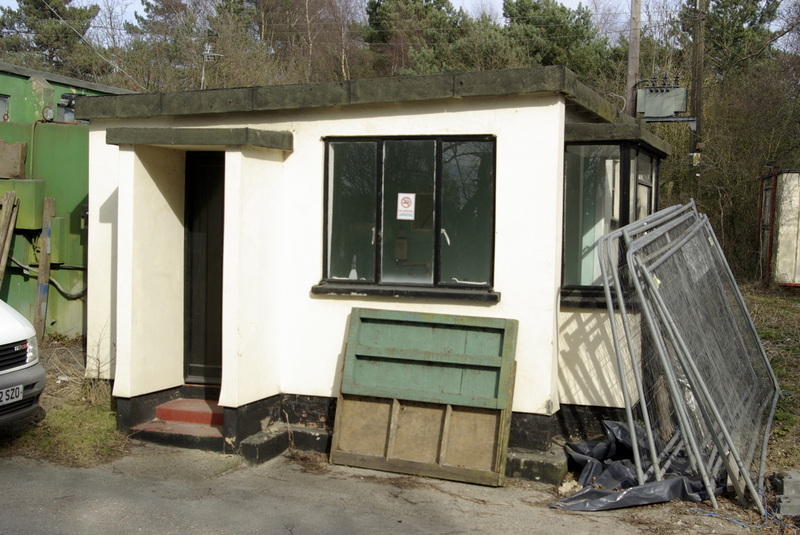 Personnel from differing operating periods at Barnham have stated that there were up to 3 varieties of RAF Police specialisations working at the site: 'Provost' 'Station' and 'Qualified Police Dog' (dog handlers). As well as a standard outer fence and main gate picket post, the facility included an inner perimeter fence and within that an inner concrete wall with another picket post. The area between these 2 latter perimeters was classed as "sterile", with trip wires and flares in the gap between them and atop the wall, to alert the guard force to intruders. 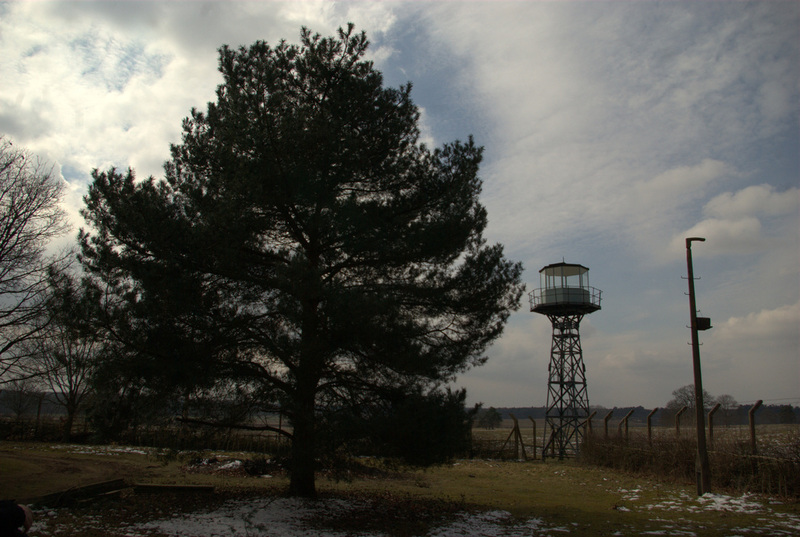 Pole-mounted lighting was positioned at regular intervals within the sterile area and halfway between the towers was a V shaped bulge in the fence to allow patrolling guards the ability to look up and down the fence line from a small path that ran within the area. A telephone post was located at these bulges. Two electric sliding gates at the outer and inner fence and a traditional style split middle wire gate acted as "vehicle traps" for anyone driving in or out. At the front sliding gate was a personnel turnstile controlled by the RAFP guardroom. At the rear sliding gate was personnel access to the inner picket where flammables and other contraband (matches, cigarettes, lighters etc) were surrendered before entering the Danger Area. RAFP Dog Handlers patrolled the site and the RAFP station staff manned the watch towers and pickets. The area between the outer and middle fence was patrolled by the Dog Handlers, with elements of the outer perimeter reportedly just spools of barbed wire. Five watch towers, one at each point of the pentagonal fence, were located on the inside of the middle fencing when the site was decommissioned. These were accessible along the path within the sterile area near the fence line, some elements of which are still visible under the moss and foliage. A 6th vantage point was located on the maintenance building towards the centre of the compound. Each tower could see the others at the time of operational use (trees get in the way now) and were fitted with searchlights at a third of the way up and right at the top, possibly similar to those used on ships. It has been reported that the angle of the lights had to be limited as the Officer Commanding RAF Lakenheath had made complaints that his pilots were getting dazzled by Barnham's watch towers. Picture SY0b © Keith Eldred. Looking from the southern Watch Tower towards the central wooden vantage point atop the building in the image centre. The northern and north eastern tower can be seen in the background c1970. The existing tall metal towers were believed to have been installed in late 1959/early 1960. 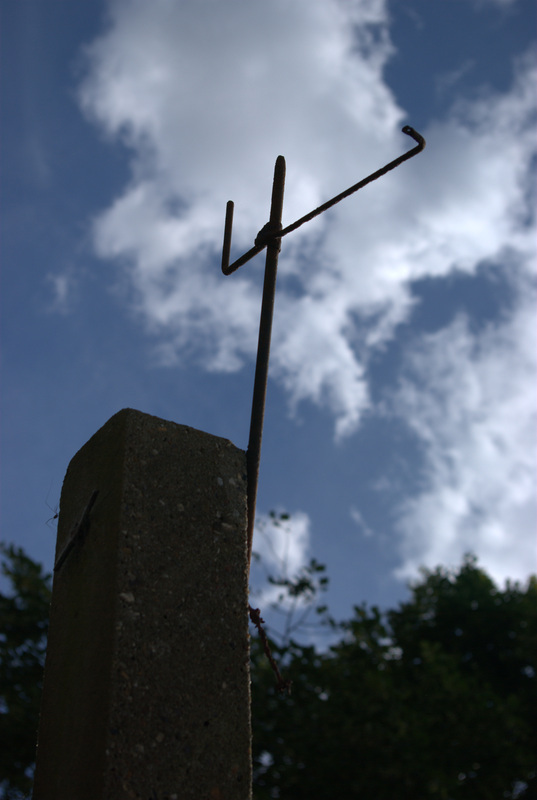 Prior to this there were wooden ones, described as being pretty basic and about 15 ft high, with a base around 6 ft square with a large searchlight mounted in the centre which could be swung almost 360 degrees in either direction. Access was reportedly by a wooden ladder and there was a single railing round about waist height. There was a field telephone at the top of the ladder and "special" binoculars were issued. The platforms were in roughly the same positions of the new towers but on the inside of the concrete path. 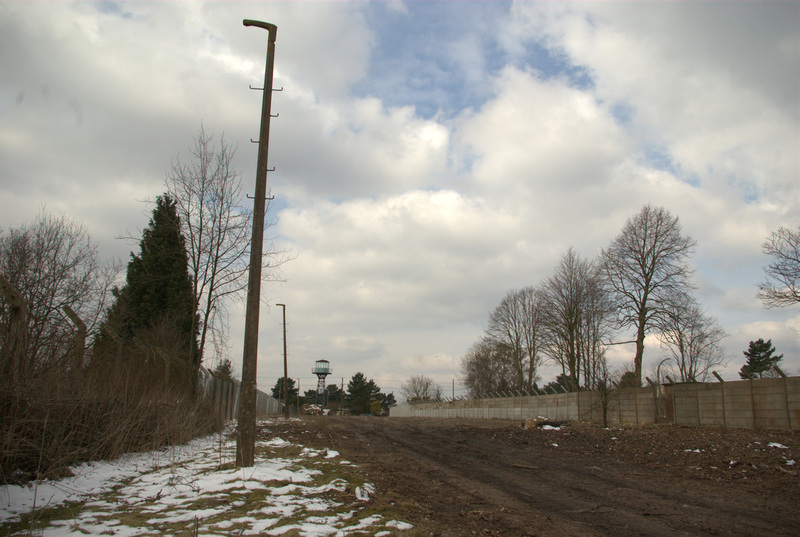 One of these older towers can be identified to the left of Picture SY3, significantly shorter than the more modern one that takes precedence in the image. It has been reported by another source that when the new towers were built, the fences had to be modified to accommodate them, via a U-shaped cut-out, visible on the site today. A former Dog Handler stated that before being posted to Barnham, you and more importantly your dog had to gain at least 90% in exams/tests, meaning they had some of the best personnel and animals in the trade. In comparison, the RAFP Station staff I've spoken to stated that they received no special training as such for the role. They did get sent on a special security course, but that it was of little relevance or use to Barnham. They simply classed it as another security related job. Some have stated that they spent a lot of time on the range, with many of the Police being marksmen. It has been reported that the RAFP were issued automatic 9mm pistols towards the end of the site's operational period, replacing the Smith and Wesson .38 that had been in common use. The shift pattern recalled by most RAFP personnel I have spoken to consisted of 9 consecutive shifts comprising 3 evenings (1500-2300), 3 midnights (2300-0700) and 3 days (0700-1500) which would then be followed by 2 days off. Approximately 14 Station staff were on shift, comprising of one Sergeant shift controller, one Corporal deputy shift controller and 12 others, some made up of National Service personnel. Therefore, with an off duty shift, this meant a guard force of around 56, plus all of the "X" flight staff (the term used for those involved with the weapon convoys), which had around 14 personnel. It was usually an hour on and an hour off on the old wooden watch towers. with no day patrols. Around 8 dogs were on site at a time. This and other RAFP sources have told me that the security personnel knew very little about the goings on inside, even with the vantage points of the tower. It is reported that all movements were specially screened to be hidden from view, with even the large bombs themselves sheeted. One RAFP officer is even reporting as quipping to a convoy commander about "another glider" coming in, making reference to the similarity between the Blue Danube pantechnicon and a glider trailer. Photography was forbidden on site, meaning that most of the history is not documented in pictures and some imagination has to be used to convert the site's current layout into the 1950s version via personnel accounts. There have been varied recollections on whether rum rations were issued during extreme cold weather at night. Whether this is due to a different period of time that those who remember it were there or not, I cannot decipher. Two former RAFP gave me a very detailed description of a large rum bottle that was used for those on night shift during the harsher winter nights, and how it tasted terrible after it was watered down every time some was drawn! Picture SY0b © Sam Tolley. 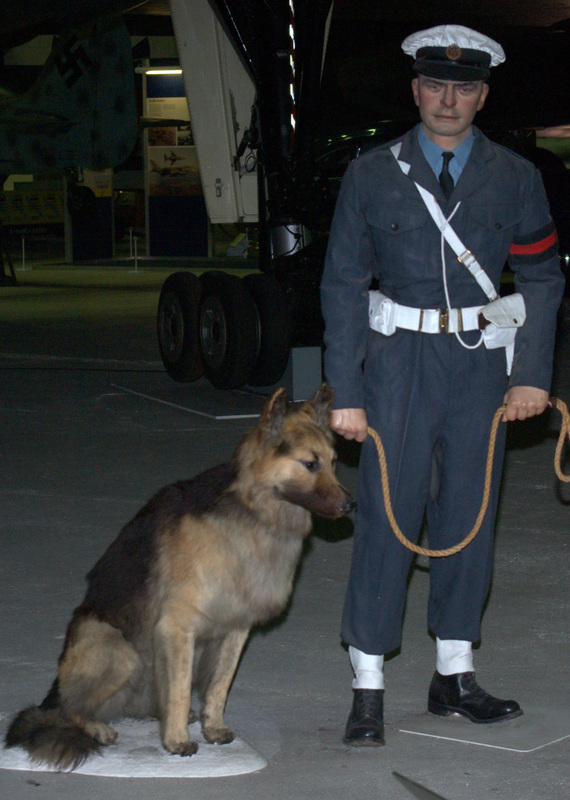 Representation of an RAFP Dog Handler, taken at the RAF Museum, Hendon, October 2013. Picture SY1 © Sam Tolley. 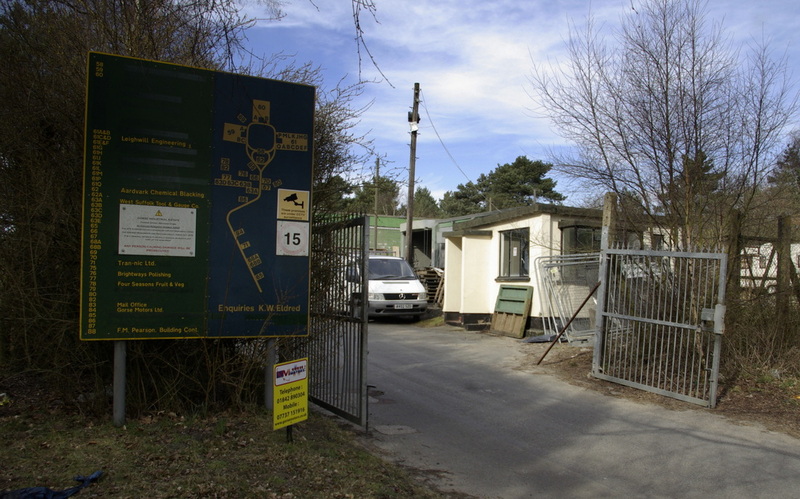 A view from the main entrance to the site from Elveden Road. 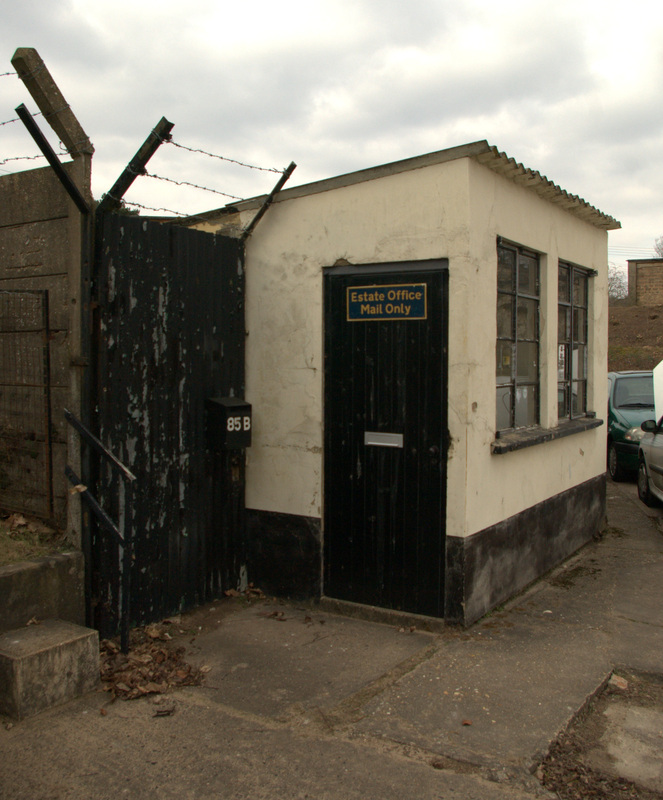 The outer picket post / guardroom is visible to the front of the van. Different recollections of how this was manned have been provided for different eras in Barnham's history, with a former RAFP from c1958 recalling that it was always manned by 2 personnel, one of which was the Deputy Controller who was normally a Provost. Later accounts suggest that at night a single RAFP Dog Handler controlled the gate. Picture SY1a and SY1b © Sam Tolley. The outer picket post. Picture SY2 © Sam Tolley. 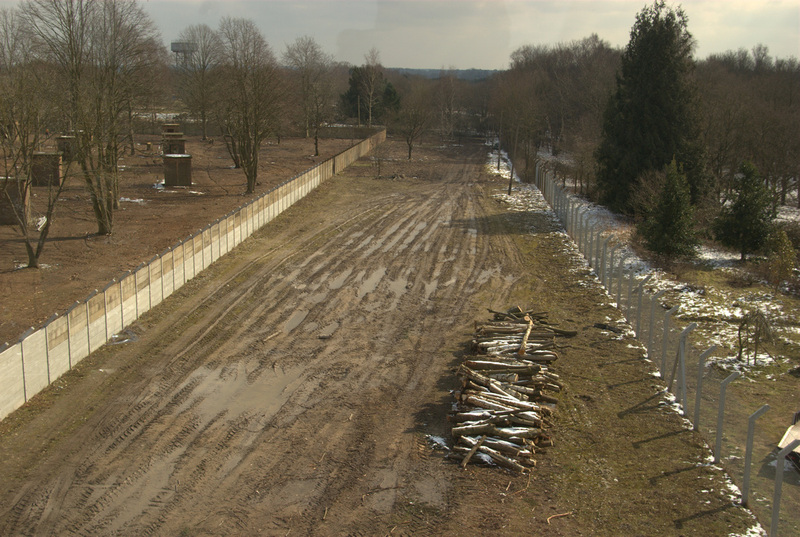 Image taken from the Danger Area entrance watch tower, showing the inner wire fence (image right) and the concrete wall (image left). At the end of the wire fence, obsured by trees at present, is another watch tower. This area in between was known as the sterile area and would have contained trip wires and flares with the patrol footpath at the left extremity. In recollections from a former RAFP, pheasants regularly set the trip wires off and in the summer the unit's fire engine had to come and put out fires caused by the flares igniting the dry grass. 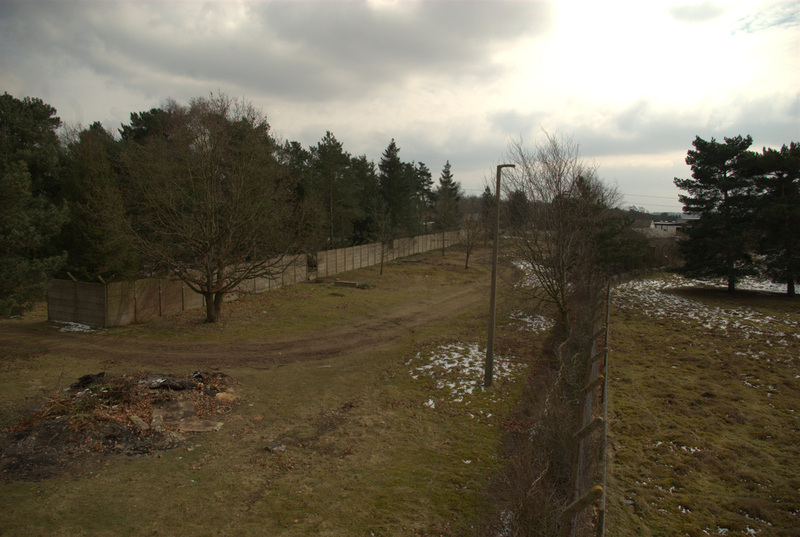 The dogs used to patrol an area between the fence on the right and the outer fence (not visible). Picture SY3 (Unknown Owner, annotations by Sam Tolley). This is looking south, probably from the watch point on the maintenance and storage building. 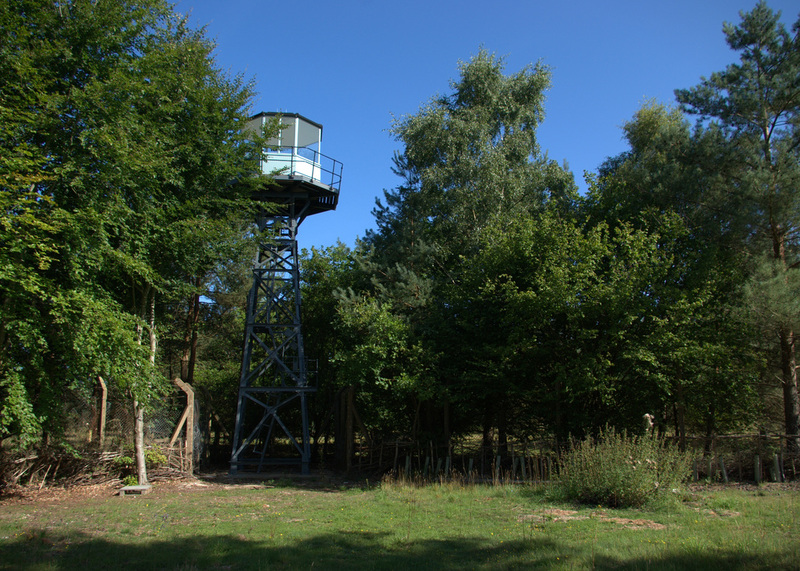 An older style wooden watch tower can be seen image left, with the more modern, taller and metal one in a prominent position near the inner sliding gate. You can just make out the inner wire fence gate between the 2 sliding gate locations. At the image bottom right is the inner RAF Police picket post. You can see the open hatch on this building where the staff surrendered their cigarettes and other contraband. As stated on a previous page, I believe this picture was taken post operational use, due to the open gates and that the fact that a picture was allowed to be taken. Picture SY4 © Sam Tolley. 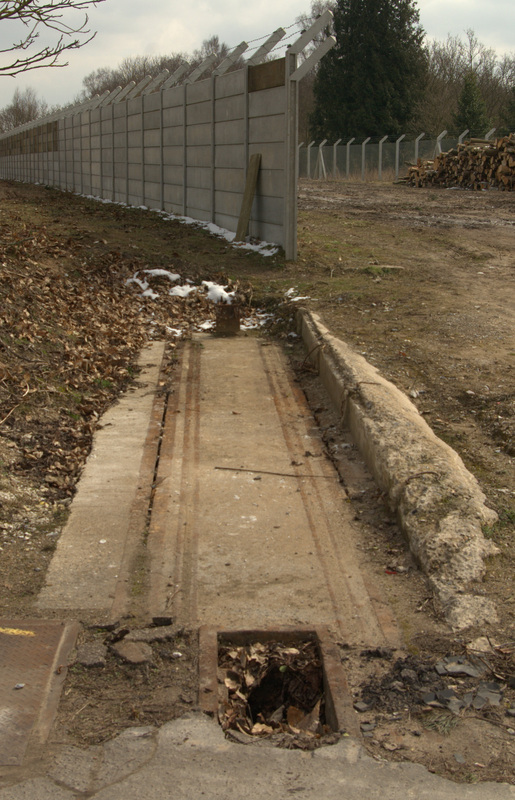 This is showing the former position of the outer sliding gate, with entrance to the Danger Area being on the image left. At the other end of the rail (behind the camera) was a personnel turnstile, operated by the RAF Guard Force. The building image left is part of the main administration block. Picture SY5 ©Sam Tolley. The location of the inner sliding security gate where it abuts the inner concrete wall. Behind the camera man is the RAFP inner picket post. Picture SY6 © Sam Tolley. Looking into the Danger Area from the vehicle trap. This is the inner RAF Police picket post. The inner concrete wall is visible image left and sliding gate runner bottom right. There was a personnel gate here and is at this point that the RAFP would check access passes again, as well as remove all cigarettes, lighters, matches and any other contraband from personnel before they entered the Danger Area. The Danger Area personnel would enter through the door here, walk through the building and out of a door on the other side, currently blocked up. Picture SY6a (c) John "Wedders" Wedlake. 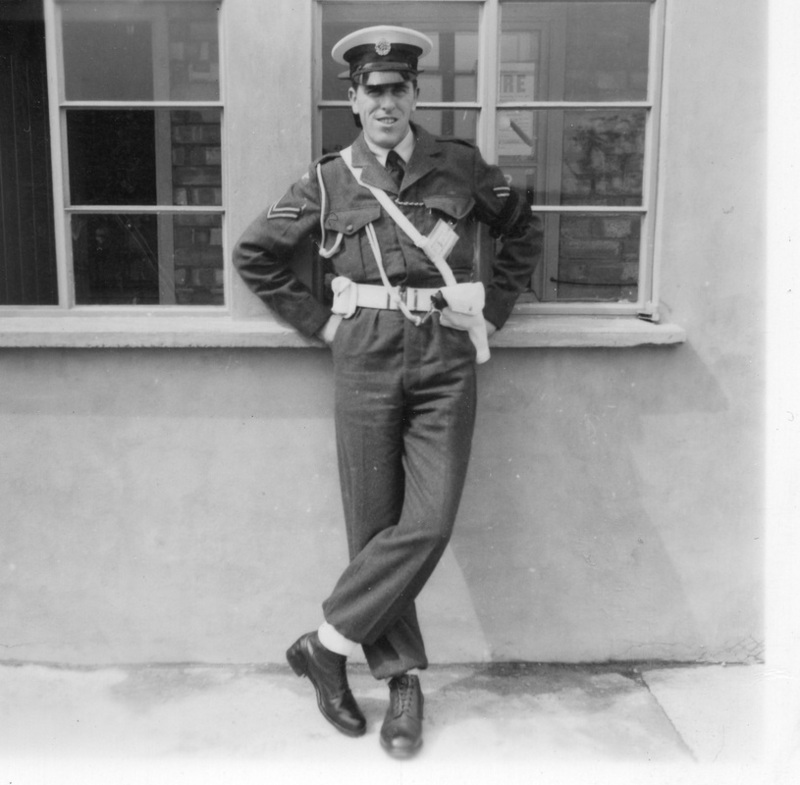 The image owner in front of the inner picket post, circa early 1960s. Note the white webbing and pistol. The area immediately behind the windows is the walkway through the building linking the sterile area to the Danger Area. Picture SY7 ©Sam Tolley. 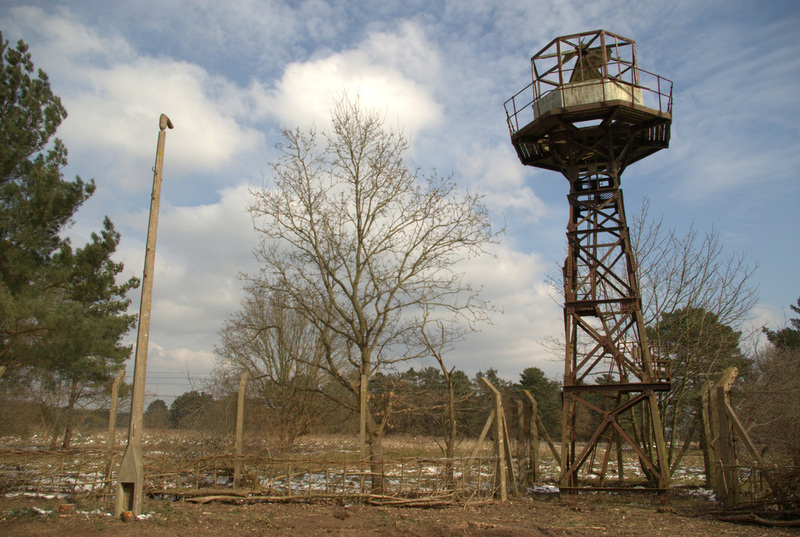 Watch tower at the main entrance to the Danger Area, the inner wire fence and gates are visible to its rear along with the original site fire engine shed. Picture SY8 © Sam Tolley. The watch towers had a search light on top controlled by a handle coming through roof and a second search light about 15 ft up the structure (visible in SY7). The top light was accessible through a small hatch in the roof. These have been reported to be immensly powerful and the same as used on air-sea rescue launches. Picture SY9 © Sam Tolley. 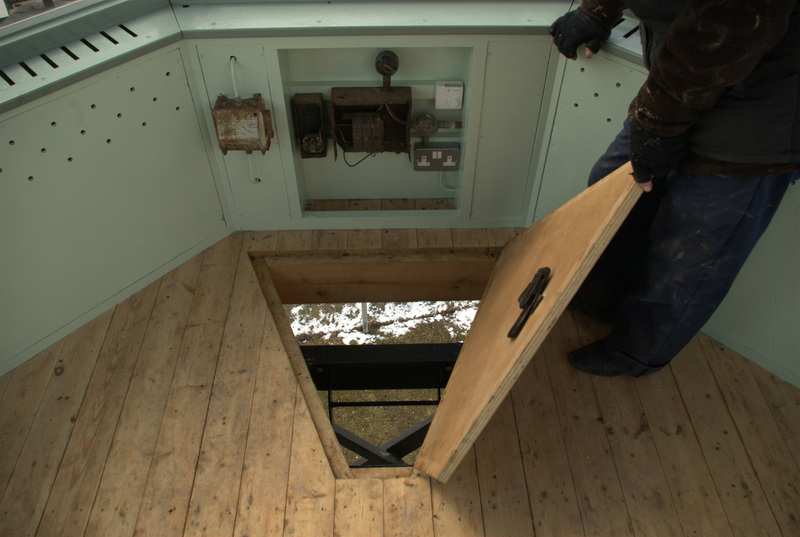 The rather slim hatch to get in and out of the tower. The towers were heated to provide some comfort to the RAFP up there. 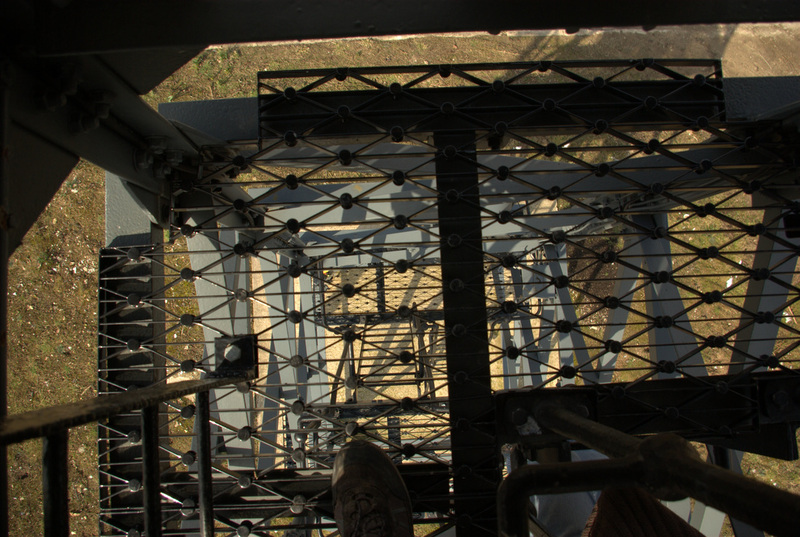 Interestingly, there was no door to get out on to the walkway around the top of the tower. The guards had to climb through a window, no easy feat on a winter's windy day in cold weather gear. Ultimately, it is plain to see what an improvement these towers were on the older open topped wooden ones. Picture SY11 & SY12 © Sam Tolley. 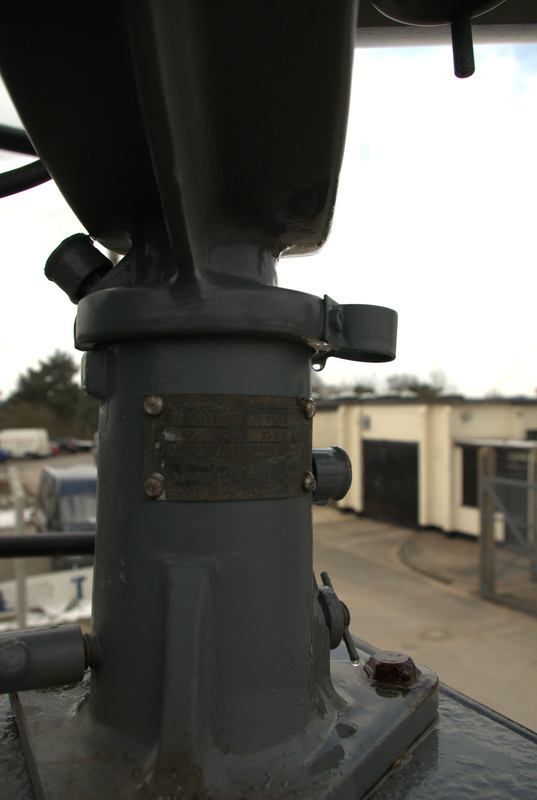 Detail of the search light 15ft off the ground. Made by Sperry, the plaque reads "THE SPERRY GYROSCOPE 18" SPOT MOUNTING SEARCHLIGHT MK EIX MOD 22". Oddly, the plaque is upside down on the mount, suggesting that the usual mounting application was the opposite to these ones. Picture SY13 © Sam Tolley. Within the sterile area looking from from the eastern watch tower base to the Danger Area entrance. 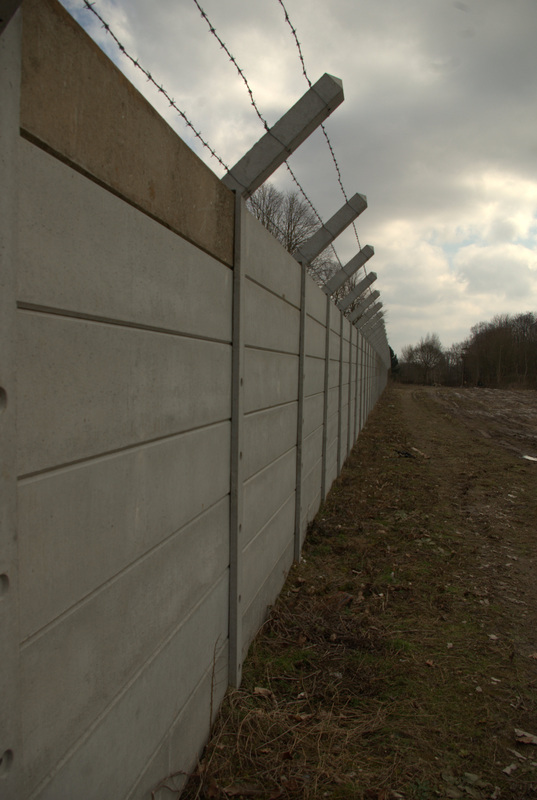 The inner wire fence is image left and inner concrete wall is on the right. You can clearly see the regularly spaced lighting and the watch tower at the entrance. A telephone point would have been located halfway down the wire fence. Picture SY14 & SY 14a © Sam Tolley. The slotted inner concrete wall with barbed wire atop. Inside lay the fissile core storage igloos. There would have been additional flare mounts on some of these posts, as per the picture below. Picture SY15 & SY16 © Sam Tolley. 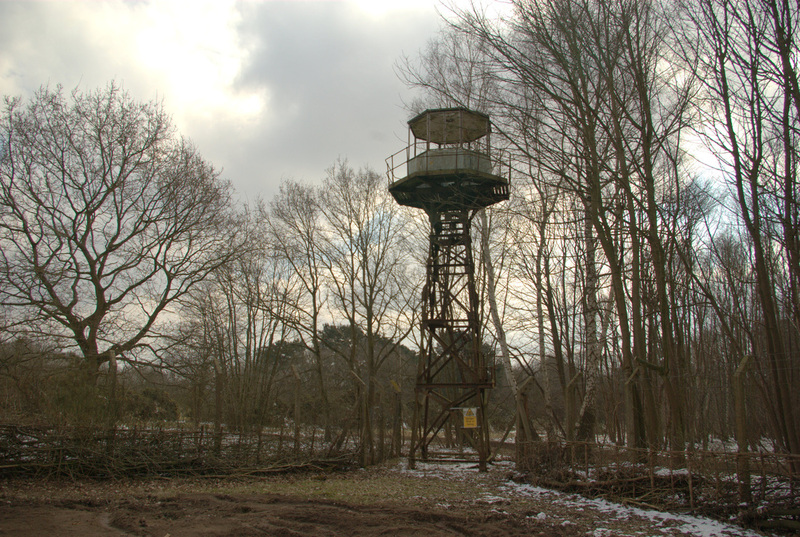 The SE Watch Tower, being left to show the effect of nature on the site. The other 4 towers have either been or will be restored to their former glory as part of the English Heritage support. Picture SY17 (left) © Sam Tolley. 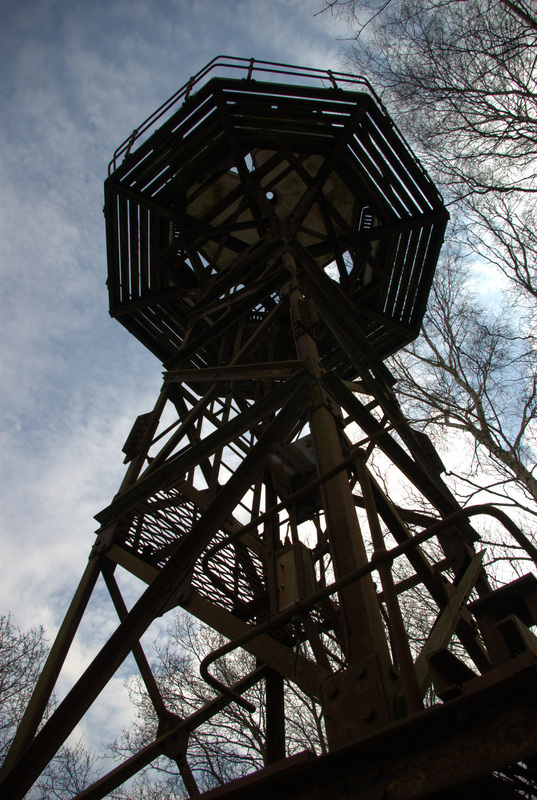 NE watch tower, awaiting restoration in early 2013. Work was under way on it in August 2013. Picture SY17a (below) ©Sam Tolley. Northern watch tower, restored by August 2013. Picture SY18 & SY18a ©Sam Tolley. The western watch tower after restoration. SY 18b © SamTolley. The western tower in August 2013 when 2 former site RAF Policemen visited. A walkway is visible leading towards it, parallel to the fence, albeit now covered in moss. This walkway was the only area the RAFP could walk in the sterile area due to the trip wires and flares. Picture SY19 © Sam Tolley. A view from halfway up the western tower at the corner point. The fire pile is where trees have been getting cleared as part of the conservation. 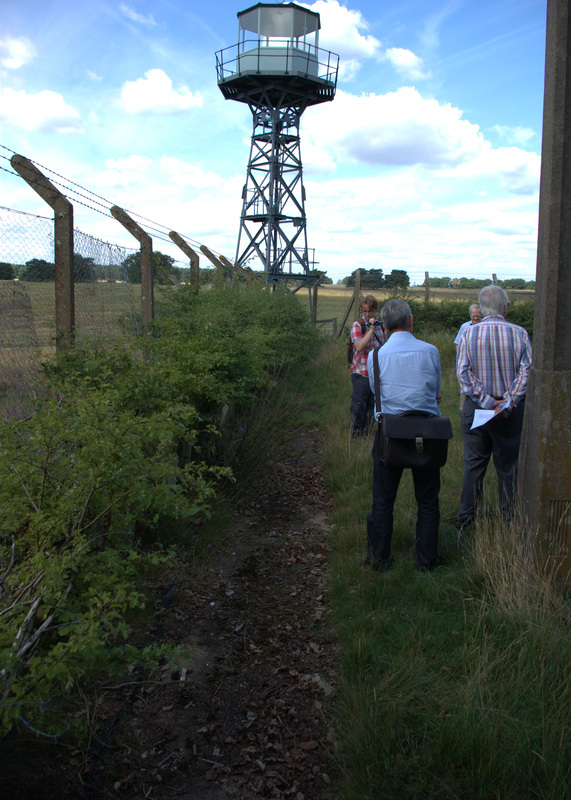 Just inside the wire fence and alongside the bushes (grown post-decommissioning) is evidence of the original path to access the towers without setting off the flares. Picture SY19a © Sam Tolley. Panoramic from the western tower base, looking north and east. Picture SY19b © Sam Tolley. I think the path image right is the previous location of the outer wire fence/barbed wire area. It is in this area that the dog handlers would routinely patrol at night. Picture SY20 © Sam Tolley. A 360 degree composite panorama taken from the former position of the centralised watch tower atop the Maintenance Building, the mountings for which can be seen in the image. Picture SY21 © martyboy2 of Britain (by his kind permission). Smith and Wesson .38 revolver and pouch. A US design made under licence in the UK during the WW2. During the latter part of the site's history, these pistols were replaced with 9mm automatic pistols. A former RAFP informed me that the only security breach he could recall, apart from HQ P&SS (Headquarters Provost & Security Services) attempted break-ins, was when a group of trainee officers from Cranwell got disorientated on a night exercise and wandered into the outer perimeter, one of whom got entangled in the barbed wire close to the RAFP's tower. He couldn't move and said to the dog handler who caught them "Can you help me out?" And got the answer "No, but my dog can!!" There is extensive official record of the HQ P&SS exercising the security at Barnham, with all of the faux intruders being apprehended. This not only included those trying to break through the fencelines, but also those trying to gain access with false papers. Such accounts were well documented in an English Heritage National Archive Source Analysis document for Barnham, which can be found at: http://services.english-heritage.org.uk/ResearchReportsPdfs/048_2011WEB.pdf. According to these accounts, only once did a P&SS member get into the Danger Area. In the official records, there is reference to a fear that "Ban the Bomb" protests would happen at Barnham in late 1961. The records go on to state that they didn't but it was a useful paperwork exercise to make sure they were prepared. Interestingly though, the accounts of 2 former RAFP state that they remember that the Campaign for Nuclear Disarmament (CND) did protest at the site and were beaten back with fire hoses from the site's fire engine when they tried to climb the fence. Picture NC9 © Anon 5. 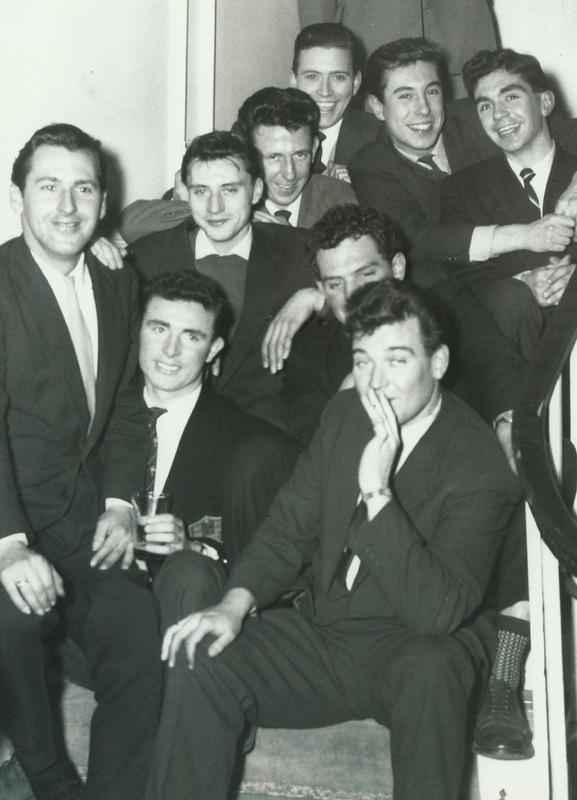 Members of the RAF Police at Barnham c1959. The largest number of personnel who have contributed to this website have been RAFP. This is perhaps unsurprising when the high-security nature of the facility is considered and the requirement placed upon the RAFP trade to support. An estimated 70 members of RAFP were associated with Barnham at any given time, split between general security duties, dog handlers and X-Flight convoys. 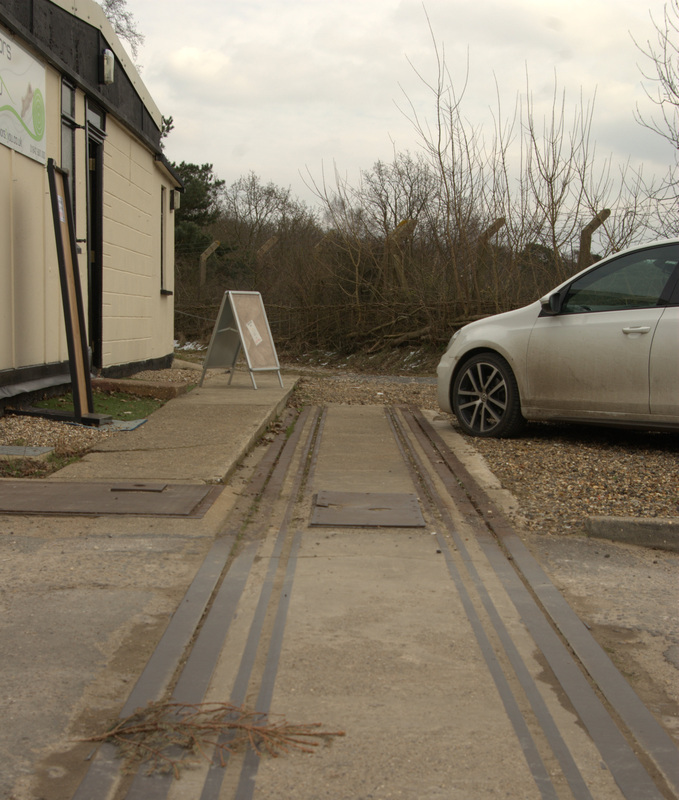 These personnel were often posted after 2 years or left their National Service, so over Barnham's approximate 8 year history there is potential for up to 280 RAFP to have cycled through the station.